I met up with my friend Evan yesterday morning, and we had the best time making our Christmas cookie jars. We were super inspired by the one Tamara created for Becky on Instagram, and spending that time crafting yesterday was just what the doctor ordered. Unfortunately, we found out our hard drive is officially toast, and none of our photos/files/footage are recoverable. 🙁 The good news? We don’t have to pay Data Savers thousands of dollars to recover anything. The bad news? Two years worth of work and my almost-finished episode 3 for The Design Network was on that hard drive. We’re especially bummed to have lost all that video footage, but I do still have all the photos from Kathy’s new space (I hadn’t uploaded them yet), so I look forward to sharing the before and afters with you here on my blog very soon! Anywho- back to Christmas crafting! 😀 Evan brought over the cookie jars, glitter paper, star punch, bird nest, wooden beads and tapered corks, and I picked up the Epson salt, miniature fence and Christmas lights. I already had the twine, and we gathered the twigs from our front yard. 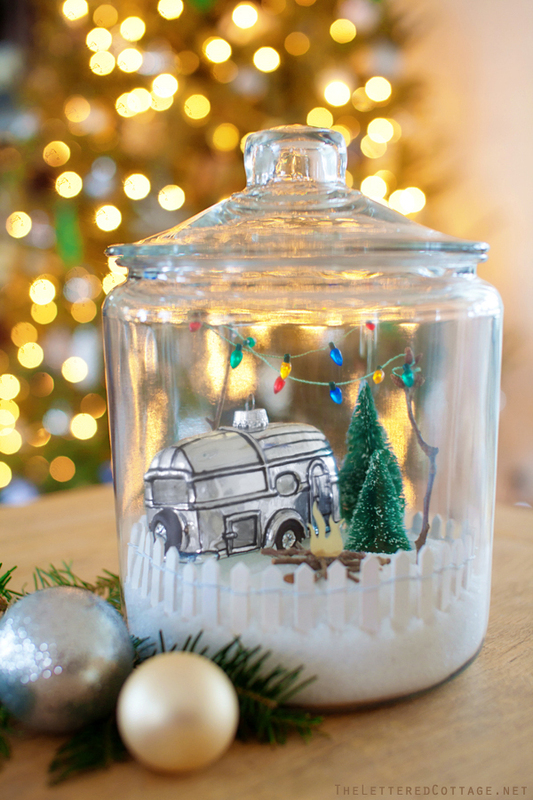 Becky‘s talented friend Tamara put a cute little camper ornament in her cookie jar too, and I immediately thought of our Airstream ornament when I saw hers pop up in Becky’s Instagram feed. Evan and I used twigs to support the lower strand of Christmas lights and create the campfire, and I cut the flames out of a translucent piece of gold scrapbook paper. 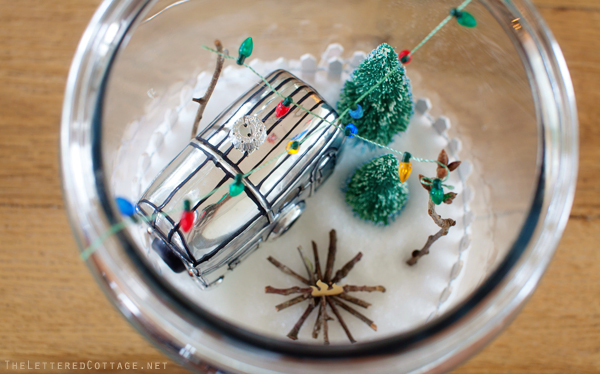 These jars were SO much fun to make, and I think it would be a great craft for kids, too. The sky’s the limit when it comes to what you fill them with, and where you can display them. Thanks again to Tamara and Becky for inspiring this fun project and to Evan for always making everything so much merrier! Merry Christmas! Hope you’re having a calm and creative weekend, too! This is absolutely precious! Thank you so much for sharing!!! Love the jar craft. I am saving this one! I am so sorry all your work was lost. 🙁 I want to wish you and Kevin a wonderful, joyous Christmas! Thank you for the gifts you give to me through your posts! 🙂 You brighten the days of so many through your writing, sharing, photos, ideas, and amazing, radiating spirit and smile! May I suggest: get Carbonite online backup! I’ve been using it for a year — it’s automatic, everything is safe and recoverable, it’s cheap and it’s safe. So sorry you lost all of your hard work! I’m sure you and Kevin will make even more amazing video footage the second time around. Thanks for sharing the cookie jar craft. I might try that with my kiddos this week! 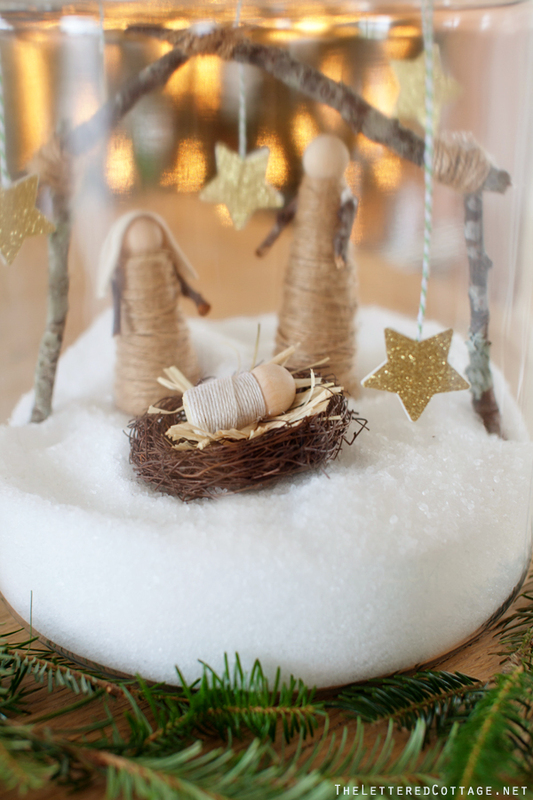 I love what you did with the jars – so clever and so cute, what a great gift. I used the same jar (such a bargain for such a nice jar) for a post on my blog and thought I would share with you. I just pinned these, so cute. Your effort appreciated. Layla, I’m so sorry to hear about your lost work. I’ve been there, done that before and it really is such a bummer. Mine had all of my business forms/templates, etc., on it which I did not back up (silly I know). Thank you for sharing these lovely Christmas container crafts-how fun!!! I’ve been looking for the perfect nativity scene, I think I just need to make this one, it’s ADORABLE! Homemade always has so many wonderful memories. Since it’s our first Christmas with our baby girl I’ve been wanting to make it extra special. These are fantastic…I love the little baby Jesus. So creative and fun! so cute! a vintage tree lot snow globe! lucky me i just picked up the same ornament yesterday : ) I need to make one since i picked up the perfect sign from mary at her shop urban farmgirl. sorry for the computer bad luck – good reminder to all of us (me). hope you have a happy holiday. 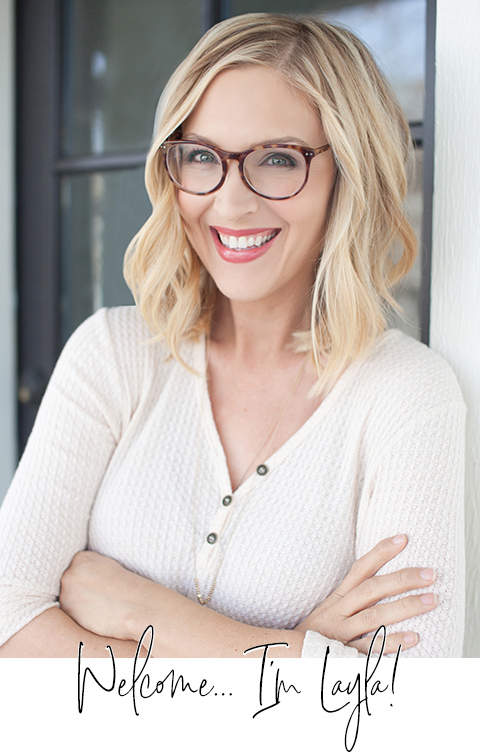 love the cookie jars decorated with evan…….just signed up for his blog too — I always enjoy yours and am very happy with your good news for a bundle of love to arrive soon. That’s not good news on your hard drive. 🙁 Wish they had warning signs. Merry Christmas Layla and Kevin! 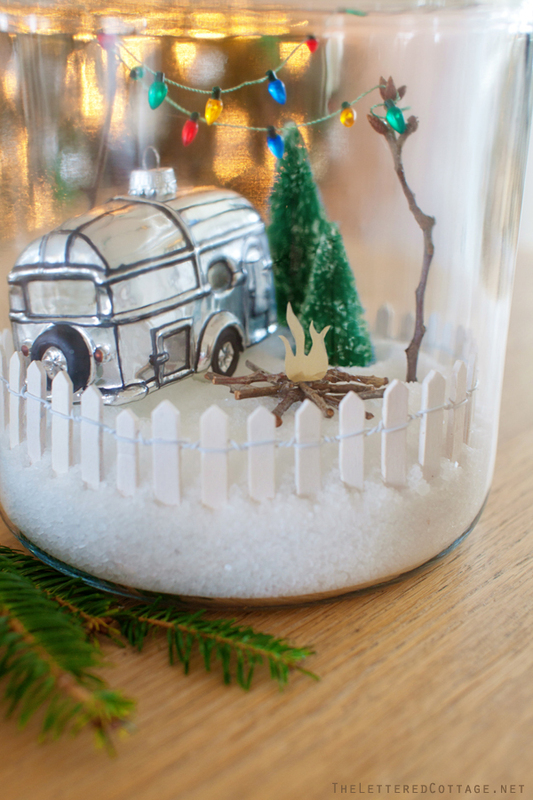 It looks like you guys had so much fun and the jars turned out super cute! I wish I could have been crafting with you guys! I would have brought cookies for us to snack on and plastic deer to add my jar. These are so darn cute! 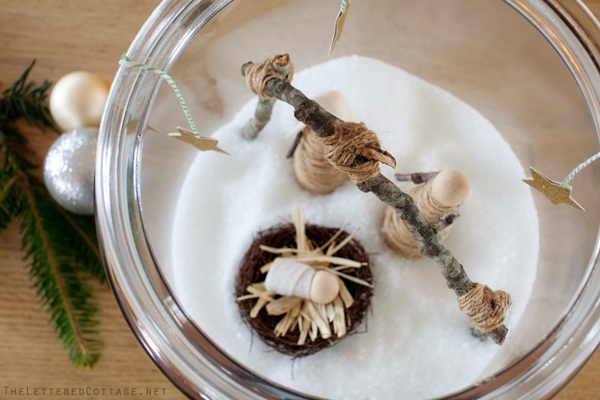 I’ve seen similar vignettes in canning jars but these have so much more impact. Thanks for sharing. I’m so so sorry about your hard drive. Last year, I didn’t back up my laptop and lost so many pictures – so bummed, so I know your feeling. Hope you’re not too busy these last days before Christmas. I saw it on Becky’s IG feed, too. I need to try this with my kiddos next year! Maybe I could figure out a winter version?! Love it! Can I ask what size jar? 1 gallon? 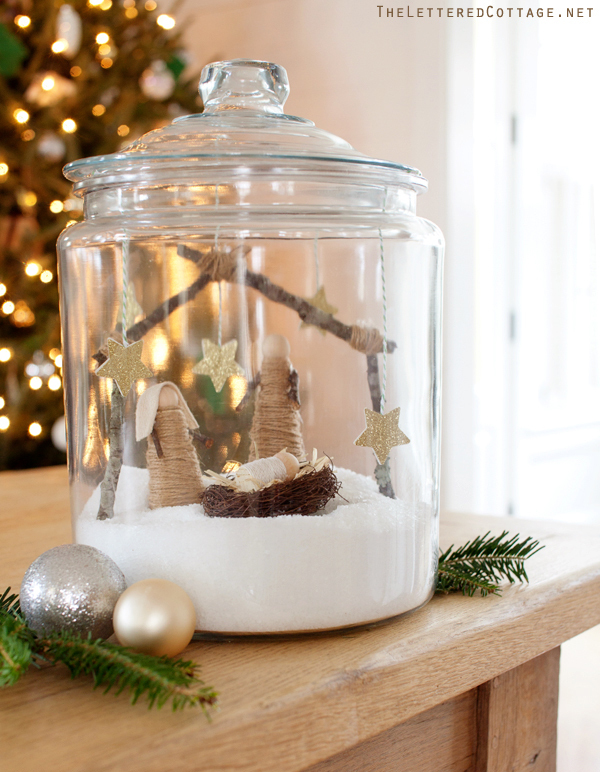 Where did you find the jars and what is the snow? Sorry for your computer problem. Been there, done that. Okay – that nativity is dang cute!!! 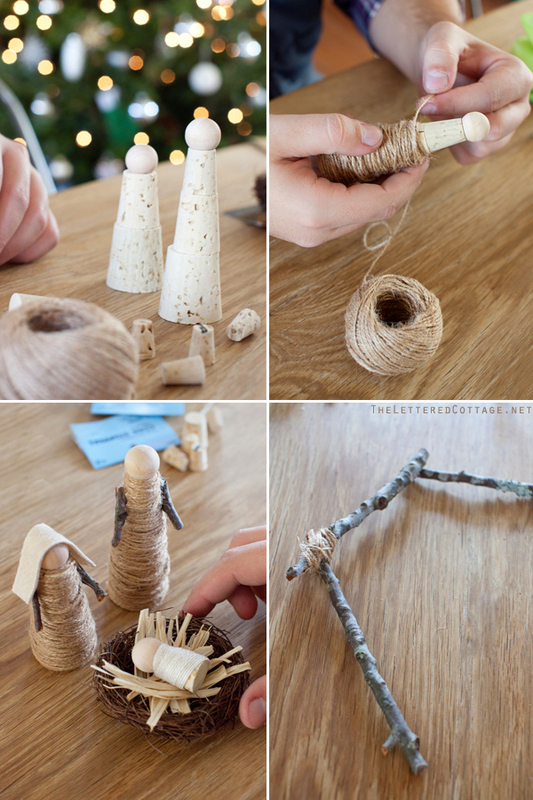 This is hands down the cutest Christmas craft I have seen! Those jars look so magical and fun for all ages to admire. The nativity is awesome! I am a faithful follower of your lovely, refreshing blog! Usually I don’t comment but just “follow.” But….I had a similar experience with my hard drive which contained all my photos of a once-in-a-lifetime trip to Brazil…of course, the only copies. I was desparate – when EVERY computer tech from the local firms who looked at my hard drive said it was toast…I still took the chance and sent it away to a commercial data saver company…I thought it was worth the risk and what more did I have to lose than my photos? For $800, they WERE able to recover my photos even though all the other local tech firms who tried failed. Don’t give up….send it to Datasavers. You may be out a few hundred dollars but….if they recover the photos it will be SO worth it!! Merry Christmas from Oregon. Mays yours be blessed! Hi Mary! Data Savers is actually who we sent it to. 🙁 They gave us an initial estimate of $700-2700 (for economy service) and $900-$3900 (for rush service) depending on what was wrong with it, but after a couple of days, they called to tell us the card was completely ruined. We learned a very valuable lesson, for sure!